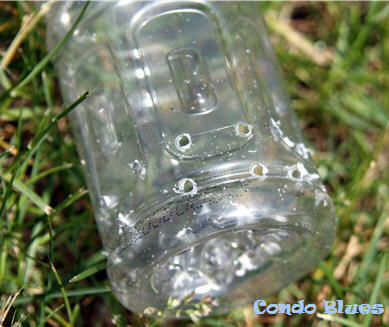 Small plastic bottles with a screw cap – this will be your watering tube. 1. 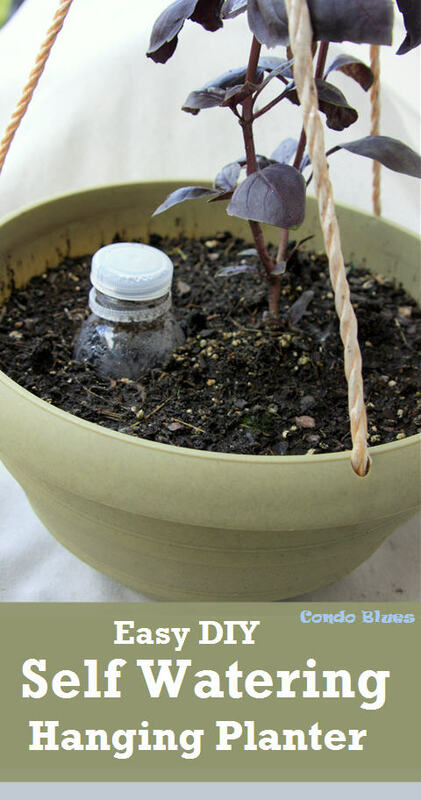 Use the scissors or Dremel to cut the bottom off the plastic drink bottle to make your planter’s wicking chamber if you are not using a mini clay flower pot. Next, use the Dremel to drill a series of holes in the bottom and sides of the wicking pot. 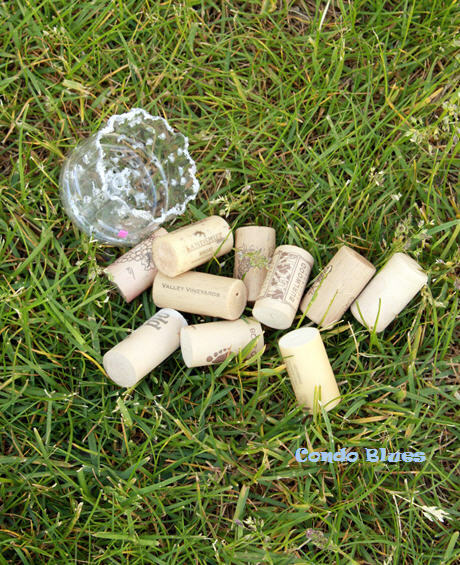 I only drink wine for the corks. I used both types of wicking chambers in my planters and they work equally well. 2. On the outside of the flower pot, measure the height of the wicking pot, add ¼ inch, and use the drill to drill a water overflow hole at that measurement. You don't want the roots of your flowers and herbs to get waterlogged! 3. Cut a piece of window screen tape that is large enough to cover the drainage hole with the scissors and use it to cover the over flow hole on the inside of the planter pot. This will discourage mosquitoes from using the still water in the bottom of the hanging pot as a nursery. 4. Use the Dremel to drill a series of watering holes in the bottom and sides of a plastic bottle to make the watering tube. This project is a great excuse to treat yourself to a few bottles of cold pressed fruit juice – yum! 5. 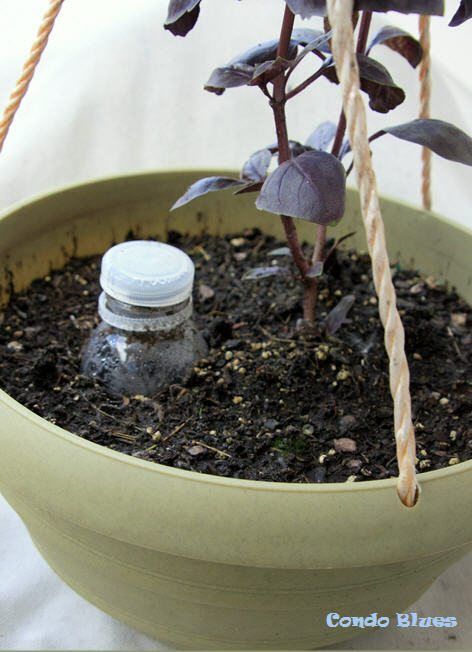 Fill the wicking pot with potting soil and put the watering tube (bottle) and the wicking pot in the bottom of the hanging planter pot. Basically what you need is something that is much lighter weight than pea gravel otherwise your planter will be too heavy to hang once you plant it. Guess how I know? What you will end up with is something that looks similar to the this big guy. 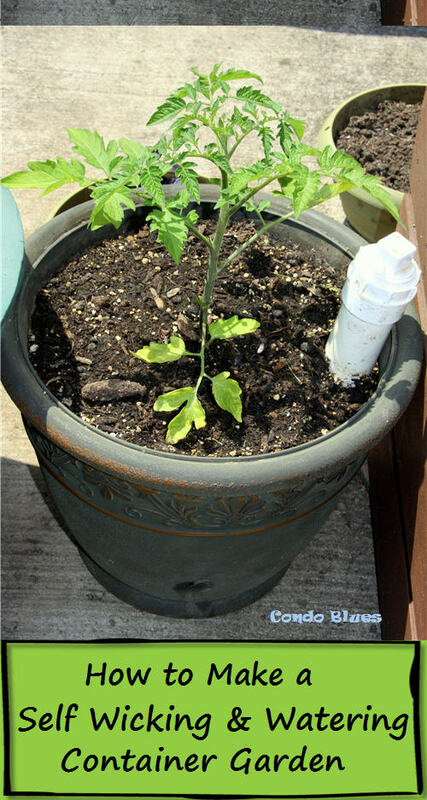 Read my DIY self watering tomato pot tutorial on Condo Blues here. 7. 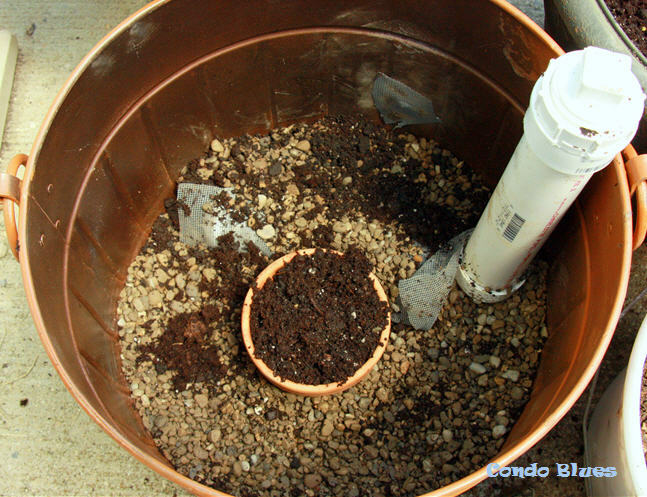 Fill the rest of the planter with potting soil and soil amendments if desired. 8. Plant your seeds, water them, and watch them grow! I am growing Opal Basil in this part of my patio kitchen garden. Have you tried it? What do you cook with it? The twist cap on the watering tube (bottle) also discourages misquotes and pests from potentially breeding in the watering chamber of my flower pots. I think it looks more finished too.